Potential Medicare expansion plans would drastically impact the financial standing of health systems, though some may be more pragmatic solutions than others. Implementing Medicare for All as a single payer healthcare system is estimated to create a 22.1% negative impact on a mid-size regional provider’s net margin. However, a voluntary buy-in plan, also known as ‘Medicare for more,’ might result in only a slight dip to the net margin compared to the status quo. Regardless, some amount of legislative action regarding Medicare expansion will be necessary in the next five years, according to the study’s authors. Hospital and health systems should remain aware of the financial impact that several Medicare expansion proposals could have on their respect organizations, according to a Navigant study released Friday afternoon. Fresh off the 2018 midterm elections where healthcare played a critical role in the electoral shift that saw Democrats retake the House of Representatives, 2020 presidential candidates are heralding sweeping policy proposals to expand coverage through Medicare. While several versions of Medicare for All legislation exist, other policy proposals such as ‘Medicare for more’ or the public option have drawn consideration from lawmakers as potentially more viable or pragmatic solutions to America’s healthcare problems. In its analysis, Navigant found a medium-sized, nonprofit, multi-hospital system with revenues of more than $1 billion and a current operating margin of 2.3% would endure vastly different financial implications under several proposed federal healthcare policy changes. Medicare for All would reduce revenues by around $330 million, a margin drop of just over 22%, the public option proposal would cause revenue declines in the neighborhood of $153 million, a margin impact of -6.3%, and the ‘Medicare for more’ expansion plan is estimated to have a neutral impact compared to the status quo. Still, Navigant’s study points out that if Congress does not act on Medicare expansion until after the next presidential election, hospitals could face a scenario with a financial impact comparable to the public option proposal. Using the model health system as an example, status quo projections without any cost reduction initiatives would see the organization’s net margin decline from 2.3% to negative 6.2% from 2018 to 2023, with operating costs rising between 4.5% to 5% per year and revenues growing at 2.5% to 3% per year. Leibach said that the analysis arrives at the early part of the conversation surrounding widespread Medicare expansion at the federal level, which makes it difficult to gauge how health system leaders will react to Navigant’s findings. Some may be hesistant to support plans that are projected to create such a negative material impact on their respective bottom lines, but others may be willing to consider a policy proposal that significant decreases or even eliminates bad debt costs associated with a large uninsured population. Even before the report was released, however, the American Hospital Association declined to voice support for Medicare for All late last month. Leibach added that he was surprised by the “nominal impact” of the voluntary buy-in plan, arguing that could hospital leaders may rally around that proposal as a compromise to expanding Medicare without fully deteriorating their financial standing. This approach would also be the least disruptive to the commercial insurance market, according to Leibach, assuming that the Medicare for All proposal would be a true single-payer platform that eliminates private insurers. The U.S. health insurance system comprises both private (employer and individual market and marketplace plans) and public (Medicare and Medicaid) coverage sources, as the table below shows. In addition, both coverage sources are paid for by a mix of private and taxpayer-financed public dollars. Most Americans get their insurance through employers, who either provide coverage through private insurers or self-insure. Employers and employees share the cost through premiums and cost-sharing such as deductibles, copayments, and coinsurance. But the federal government significantly subsidizes employer coverage by excluding employer premium contributions from employees’ taxable income. In 2018 this subsidy amounted to $280 billion, the largest single tax expenditure. About 27 million people are covered through regulated private plans sold in the individual market, including the Affordable Care Act’s marketplaces. This coverage is financed by premiums and cost-sharing paid by enrollees. The federal government subsidizes these costs for individuals with incomes under $48,560. For 44 million people, Medicaid or the Children’s Health Insurance Program is their primary source of coverage. These public programs are financed by federal and state governments, and small individual premium payments and cost-sharing in some states. In most states, these benefits are provided through private insurers. Medicare covers 54 million people over age 65 and people with disabilities. The coverage is financed by the federal government along with individual premiums and significant cost-sharing. About 20 million people get their Medicare benefits through private Medicare Advantage plans and most beneficiaries either buy supplemental private insurance or qualify for additional coverage through Medicaid to help lower out-of-pocket costs and add long-term-care benefits. The coverage expansions of the ACA — new regulation of private insurance such as requirements to cover preexisting conditions, subsidies for private coverage on the individual market, and expanded eligibility for Medicaid — lowered the number of uninsured people and made health coverage more affordable for many. But 28 million people remain uninsured and at least 44 million are underinsured. In addition, overall health care and prescription drug costs are much higher in the United States than in other wealthy countries. U.S. health care expenditures are projected to climb to nearly $6 trillion by 2027. To address these problems, some Democrats running for president in 2020 are supporting Medicare for All. Meanwhile, in Congress, Democrats have introduced a handful of bills that might be characterized as falling along a continuum, with Medicare for All at one end. Adding public plan features to private insurance. These include increasing regulation of private plans such as requiring private insurers who participate in Medicare and Medicaid to offer health plans in the ACA marketplaces, and enhancing federal subsidies for marketplace coverage. Giving people a choice of public plans alongside private plans. These bills include offering a Medicare-like public plan option through the marketplaces, extending that option to employers to offer to their employees, giving people ages 50 to 64 the option to buy in to Medicare, and giving states the option to allow people to buy in to Medicaid. These bills also bring the federal government’s leverage into provider rate-setting and prescription drug price negotiation. Making public plans the primary source of coverage in the U.S. These are Medicare-for-All bills in which all residents are eligible for a public plan that resembles the current Medicare program, but isn’t necessarily the same Medicare program we have today. The bills vary by whether people would pay premiums and face cost-sharing, the degree to which they end current insurance programs and limit private insurance, how provider rates are set, whether global budgets are used for hospitals and nursing homes, and how long-term care is financed. All of the bills in this category allow people to purchase supplemental coverage for benefits not covered by the plan. Many Democratic candidates who have called for Medicare for All are cosponsors of more than one of these bills. The continuum of approaches suggests both the possibility of building toward a Medicare for All system over time, or adopting aspects of Medicare for All without the disruption that a major shift in coverage source might create for Americans. We will continue to update the tool as new bills are introduced or refined. Users also can view a comparison tool of other wealthy countries’ health systems, which shows where select countries fall on a continuum ranging from regulated systems of public and private coverage to national insurance programs. Half of the public disapproves of the recent decision in Texas v. United States, in which a federal judge ruled that the 2010 Affordable Care Act (ACA) is unconstitutional and should not be in effect. While the judge’s ruling is broader than eliminating the ACA’s protections for people with pre-existing conditions, this particular issue continues to resonate with the public. Continuing the ACA’s protections for people with pre-existing conditions ranks among the public’s top health care priorities for the new Congress, along with lowering prescription drug costs. This month’s KFF Health Tracking Poll continues to find majority support (driven by Democrats and independents) for the federal government doing more to help provide health insurance for more Americans. One way for lawmakers to expand coverage is by broadening the role of public programs. Nearly six in ten (56 percent) favor a national Medicare-for-all plan, but overall net favorability towards such a plan ranges as high as +45 and as low as -44 after people hear common arguments about this proposal. Larger majorities of the public favor more incremental changes to the health care system such as a Medicare buy-in plan for adults between the ages of 50 and 64 (77 percent), a Medicaid buy-in plan for individuals who don’t receive health coverage through their employer (75 percent), and an optional program similar to Medicare for those who want it (74 percent). Both the Medicare buy-in plan and Medicaid buy-in plan also garner majority support from Republicans (69 percent and 64 percent­). Moving forward, half of Democrats would rather see the new Democratic majority in the U.S. House of Representatives focus their efforts on improving and protecting the ACA (51 percent), while about four in ten want them to focus on passing a national Medicare-for-all plan (38 percent). Rep. Pramila Jayapal (D-Wash.) is seeking buy-in from more fellow Democrats for a sweeping Medicare-for-all bill she is poised to release near the end of the month. It’s a proposal that has become a rallying cry for progressives and 2020 presidential candidates, but it is also exposing deep rifts in the Democratic Party over exactly how to achieve universal health coverage in the United States. The Medicare for All Act of 2019, which Jayapal had planned to roll out this week but delayed because she was seeking more co-sponsors, would create a government-run single-payer health system even more generous than the current Medicare program. Her office hasn’t publicly released the details of the upcoming measure, but Democratic members told me it would cover long-term care and mental health services, two areas where Medicare coverage is sparse. The bill also proposes to add dental, vision, prescription drugs, women’s reproductive health services, maternity and newborn care coverage to plans that would be available to people of all ages and would require no out-of-pocket costs for any services, according to a letter Jayapal sent to colleagues on Tuesday asking them to consider co-sponsoring the effort. The 150-page bill had 93 co-sponsors as of Tuesday, although Jayapal spokesman Vedant Patel said more Democrats have signed on since then. That’s still fewer than the 124 Democrats who co-sponsored a much less detailed Medicare-for-all proposal from then-Rep. John Conyers (D-Mich.) last year. A strategist who has been working with Democrats on health-care ideas told me there have been some frustrations that more members haven’t yet signed on to Jayapal’s bill, despite the fact that there are 40 more Democrats in the House this year. But Jayapal said she’s confident she’ll have 100 co-sponsors by the time of the bill’s planned Feb. 26 release, explaining she’s not surprised members would take more time to consider it given its length. Patel also noted it’s still early in the year, saying he “disagrees” with the notion that it’s taking a long time to bring Democrats on board. Yet differences are emerging among Capitol Hill Democrats over how to expand coverage, part of a larger debate roiling the party as 2020 candidates, many of them senators, and a new class of freshmen House Democrats move the party left not only on health care but also on the environment. 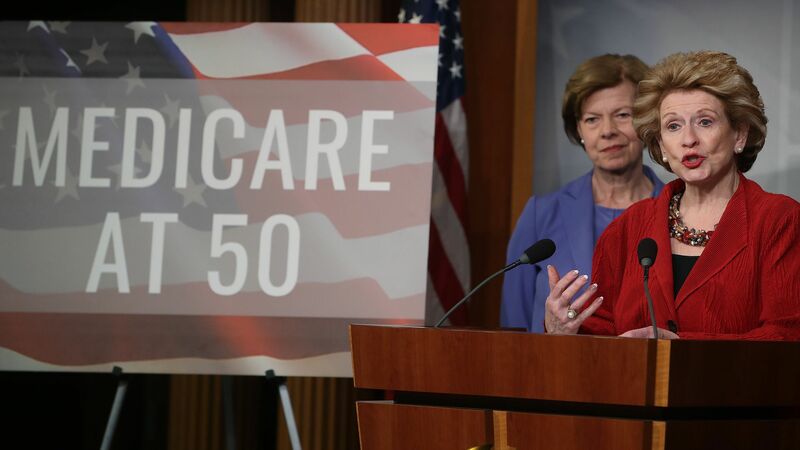 The cracks were especially apparent yesterday, as a separate group of lawmakers gathered to re-introduce their own proposal to allow people to buy in to Medicare starting at age 50. That measure, offered by Sen. Debbie Stabenow (D-Mich.) and Rep. Brian Higgins (D-N.Y.), would take a more incremental approach to expanding health coverage — one that could play better with voters who would stand to lose private coverage under a single-payer program. Their bill, dubbed the “Medicare at 50 Act,” would allow people to buy Medicare plans instead of purchasing private coverage on the Obamacare marketplaces if they are uninsured or prefer it to coverage offered in their workplace. And today, Sen. Brian Schatz (D-Hawaii) and Rep. Ben Ray Luján (D-N.M.) are reintroducing their State Public Option Act, which allows people to buy a Medicaid plan regardless of their income. That measure has broad backing from not just lawmakers (20 senators co-sponsored it last year) but also well-known health policy wonks including former Centers for Medicare and Medicaid Services Administrator Andy Slavitt. Higgins is one of several Democrats on the House Budget Committee who have proposed a total of three separate and contrasting bills to expand Medicare to more people. The others are Reps. Rosa DeLauro (D-Conn.) and Jan Schakowsky (D-Ill.), who have a bill to expand Medicare to all ages while still preserving employer-sponsored coverage, and Jayapal. Once Jayapal rolls out her legislation, the Congressional Budget Office is expected to release an analysis of how much it would cost by the end of March or the beginning of April, Budget Committee Chairman John Yarmuth (D-Ky.) told me. At that point, the committee will hold a hearing with the CBO to go over the cost and its potential impact on the federal budget. That’s where Jayapal could run into roadblocks.Given the extensive benefits she’s proposing, her bill would probably come at a steep cost to taxpayers — and paying for things is almost always Congress’s trickiest task. Of course, supporters of the legislation stress its benefits would fill in much-needed gaps in coverage under the current Medicare program. And then there’s also the question of how voters might react if told they would lose their current coverage. Sen. Kamala Harris (D-Calif.), who has gone the furthest of all the 2020 candidates in pushing for an overhaul of the U.S. health-care system, attracted widespread attention recently when she suggested she’d be fine with entirely eliminating private coverage in favor of government-run plans. “We’re very aware that there is anxiety about — however imperfect — a system you know and doctors you know, and that is going to be all part of the hearing process, public input into: How do we build a system in this country that really cares about all Americans?” said Rep. Katherine Clark (D-Mass. ), another co-sponsor of the Jayapal bill. Senator Elizabeth Warren spoke at length this week about her vision for improving the American health care system, like strengthening the Affordable Care Act and making prescription drugs more affordable. Twice, though, she ignored a question posed to her: Would she support eliminating private health insurance in favor of a single-payer system? To put it another way: I am not walking into that political trap. Ms. Warren of Massachusetts and three other liberal presidential candidates support a Medicare for All bill, which would create a single-payer health plan run by the government and increase federal spending by at least $2.5 trillion a year, according to several estimates. But Ms. Warren’s determination to sidestep an essential but deeply controversial issue at the heart of the single-payer model — would people lose the choices offered by private insurance? — illustrated one of the thorniest dilemmas for several Democrats as the 2020 primary gets underway. Their activist base, inspired by Senator Bernie Sanders of Vermont, believes that the party should unabashedly pursue universal health care, ending private insurance entirely. But polls indicate that the broader electorate, particularly the moderate- and high-income voters who propelled the party’s sweeping suburban gains in the midterms, is uneasy about this “Medicare for all” approach in which many would lose their current insurance options and pay higher taxes. Senator Kamala Harris of California drew immediate attacks from Republicans this week by taking on the issue that Ms. Warren dodged. Ms. Harris breezily acknowledged in a CNN town hall forum that she would “eliminate all of that,” referring to ending private insurance in a country where almost 60 percent of the population receives coverage through an employer. Her remark triggered an intraparty debate about an issue that until now had been largely theoretical: A decade after Democrats pushed through the most significant expansion of health care since the Great Society, should they build incrementally on the Affordable Care Act or scrap the insurance sector entirely and create a European-style public program? Four Democratic presidential candidates — Ms. Harris, Ms. Warren, Senator Kirsten Gillibrand of New York and Senator Cory Booker of New Jersey — are among the co-sponsors of Mr. Sanders’s Medicare for All bill, which would replace the Affordable Care Act with a single government health plan for all Americans. Medicare is the federal program providing health coverage to people 65 and older. The concept of Medicare for all has become popular with Democrats: 81 percent support it, according to a recent Kaiser poll. Yet voter opposition to surrendering the insurance they are used to led to a backlash over President Barack Obama’s repeated promise that “if you like your plan, you can keep your plan” after it proved false for several million people under his health law. Many Democrats are keenly aware of that backlash, and the 2020 presidential race will be the first where many of the party’s leading candidates will have to explain and defend the meaning of Medicare for all. For now, as Ms. Warren demonstrated, many candidates do not want to wrestle publicly with the details. After Ms. Harris’s comment, her aides hastened to add that she would also support less sweeping changes to health care; like most other candidates, Ms. Harris declined an interview request. And by Friday, Mr. Booker, hours after announcing his presidential bid, sought to curtail the matter by offering a brisk “no” when asked if he supported eliminating private coverage. Yet there is one likely 2020 contender who is thrilled to discuss Medicare for all. But Michael R. Bloomberg, the former New York City mayor who is considering a 2020 bid on a centrist Democratic platform, said it would be folly to even consider a single-payer system. “To replace the entire private system where companies provide health care for their employees would bankrupt us for a very long time,” Mr. Bloomberg told reporters in New Hampshire on Tuesday. The Congressional Budget Office has not scored Mr. Sanders’s Medicare for All bill, but a study last year by the Mercatus Center of George Mason University predicted it would increase federal spending by at least $32.6 trillion over the first decade. The cost could be even greater, the study says, if the bill overestimated the projected savings on administrative and drug costs, as well as payments to health care providers. The divide between Mr. Sanders, a democratic socialist, and Mr. Bloomberg, a Republican-turned-independent-turned-Democrat, reflects the large chasm in a party that has been reshaped by President Trump. The president’s hard-line nationalism has simultaneously nudged Democrats to the left, emboldening them to pursue unambiguously liberal policies, and drawn independents and moderate Republicans to the party because they cannot abide his incendiary conduct and demagogy on race. These dueling forces have created a growing but ungainly coalition that shares contempt for Mr. Trump but is less unified on policy matters like health care. And these divisions extend to what is wisest politically. Liberals argue that the only way to drive up turnout among unlikely voters or win back some of the voters uneasy with Hillary Clinton’s ties to corporate interests is to pursue a bold agenda and elevate issues like Medicare for all. “Those who run on incremental changes are not the ones who are going to get people excited and get people to turn out,” said Representative Pramila Jayapal of Washington, the co-chair of the Congressional Progressive Caucus. And by preserving their options, Democrats risk alienating liberal primary voters, some of whom consider support for Medicare for all a litmus test. But moderates believe that most Democratic primary voters are more fixated on defeating Mr. Trump than applying litmus tests — and that terminating employer-sponsored insurance would only frighten the sort of general election voters who are eager to cast out Mr. Trump but do not want to wholly remake the country’s health care system. “Most of the freshmen who helped take back the House got elected on: ‘We’re going to protect your health insurance even if you have a pre-existing condition,’ not ‘We’re going to take this whole system and throw it out the window,’” said Kenneth Baer, a Democratic strategist. While polling does show that Medicare for all — a buzz phrase that has lately been applied to everything from single-payer health care to programs that would allow some or all Americans to buy into Medicare or Medicaid — has broad public support, attitudes swing significantly depending on not just the details, but respondents’ age and income. On the House side, a bill similar in scope to Mr. Sanders’s is under revision and will soon be reintroduced with Ms. Jayapal as the main sponsor. Other Democrats have introduced less expansive “Medicare buy-in” bills, which would preserve the current system but would give certain Americans under 65 the option of paying for Medicare or a new “public option” plan. Another bill would give every state the option of letting residents buy into Medicaid, the government health program for poor Americans. The buy-in programs would generally cover between 60 and 80 percent of people’s medical costs and would require much less federal spending because enrollees would still pay premiums and not everyone would be eligible. 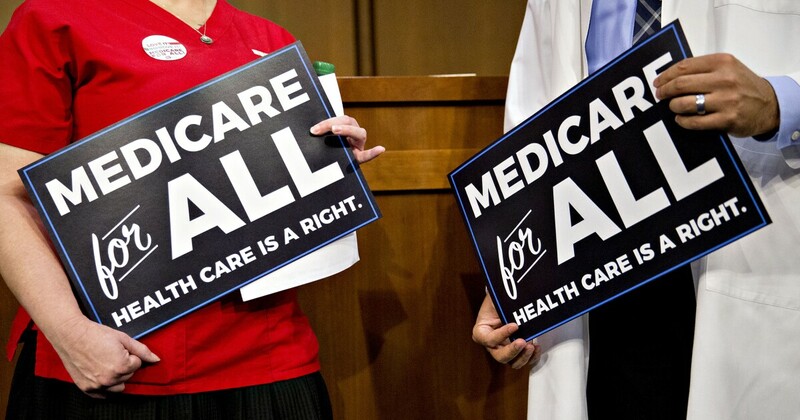 Some proponents, like Senator Jeff Merkley, Democrat of Oregon, have described them as a steppingstone on the way to a full single-payer system; some of the Democrats running for president are co-sponsoring these “Medicare for more” bills as well as Mr. Sanders’s. Mr. Sanders has suggested options to raise the money needed for his plan, such as a new 7.5 percent payroll tax and a wealth tax on the top 0.1 percent of earners. He has also predicted several trillion dollars in savings over 10 years from eliminating the tax exclusion that employers get on what they pay toward their workers’ insurance premiums, and other tax breaks. But Robert Blendon, a health policy professor at Harvard who studies public opinion, said it would be wise not to delve into financing details for now. The difficulty for Democrats, added Ezekiel Emanuel, a former Obama health care adviser, is that many voters look at the health care system the same way they view politics. “They say Congress is terrible but I like my congressman,” as Mr. Emanuel put it. According to the Gallup poll, 70 percent of Americans with private insurance rate their coverage as “excellent” or “good;” 85 percent say the same about the medical care they receive. The Kaiser poll found that the percentage of Americans who support a national health plan drops by 19 percentage points when people hear that it would eliminate insurance companies or that it would require Americans to pay more in taxes. Among those who make over $90,000 a year — the sort of voters in the House districts that several Democrats captured in the midterms — those surveyed in the Kaiser poll were particularly wary of an all-government system: 64 percent in this income group said they would oppose a Medicare for all plan that terminated private insurance. In Vermont, where former Gov. Peter Shumlin shelved his ambitious plan for a single-payer system in 2014 after conceding it would require “enormous” new taxes, advocates for universal health care are now resigned to a more incremental approach. Dr. Deb Richter, a primary care doctor who helped lead the state’s single-payer movement, said that while the Democratic field is “going to have to face the T word,” being upfront about the required tax increases, she now thinks phasing in a government-run system is a better approach. Democratic presidential contender Sen. Kamala Harris wants to “move on” from the current healthcare system in favor of a plan that would roll everyone in the U.S. onto a government plan known as “Medicare for all,” doing away with private health insurance. As the California Democrat and others in her party make their case, however, they will face considerable opposition not only in the insurance industry, but across the healthcare sector, which would see massive upheaval from the plan. And polling suggests that the public, roughly half of which relies on private insurance, isn’t quite on board. Drug companies, insurers, doctors, and hospitals have united in recent months to fight national government healthcare. One healthcare industry group, called the Partnership for America’s Health Care Future, has launched a five-figure digital ad campaign arguing that “Medicare for all” would cause massive disruption, higher taxes, lower quality care, and less choice for patients. It plans to spend six figures bashing “Medicare for all” over the course of 2019. “Whether it’s called Medicare for all, single payer, or a public option, one-size-fits-all healthcare will mean all Americans have less choice and control over the doctors, treatments, and coverage,” said Lauren Crawford Shaver, the group’s executive director. Other candidates for the Democratic nomination, such as Sens. Elizabeth Warren of Massachusetts and Kirsten Gillibrand of New York, are, like Harris, co-sponsors of the Medicare for All Act, legislation led by Sen. Bernie Sanders, I-Vt. Although it has “Medicare” in the name, the bill would go much further than current Medicare, which covers adults 65 and older and people with disabilities. It would pay for emergency surgery, prescription drugs, mental healthcare, and eye care without a copay. Children would be enrolled in the government plan soon after the the bill’s passage, and the rest would be gradually phased in after four years. This would mean that roughly half of the U.S. population, the 177 million people in the U.S. covered by private health insurance mostly through work, would be moved onto a government plan. Employers would pay higher taxes rather than pay for private plans. But healthcare providers, not just insurers, benefit from the current fragmented system, in which insurance is purchased by employers, the government, and individuals. They charge private insurers more to make up for the gap left by patients who are uninsured or are on government programs, which pay less for their services. If all privately insured individuals were to have Medicare instead, and if it were to pay the same rates it does now, then doctors and hospitals would see big losses caring for patients who moved from private coverage to the government plan. Healthcare providers have said that if taxes don’t go up to pay for the difference, then doctors and hospitals will face pay cuts and layoffs, leading to facility closures and long lines for care. Hospitals serve as the main employer in many communities. For patients, that would mean losing not only a healthcare plan they might be satisfied with, but also doctors they worked with for years or hospitals they relied on in their communities. The Medicare for All Act has not been scored by the Congressional Budget Office, but analyses from the Mercatus Center at George Mason University and the left-leaning Urban Institute found it would raise government spending over a decade by $32.6 trillion. Overall healthcare spending, though, would actually fall by $2 trillion, as private spending on healthcare would collapse. The cut would be achieved, however, through paying 40 percent less to providers than what they were getting from private insurance. Another obstacle to “Medicare for all” is the fact that the public isn’t fully convinced by the idea of nixing private insurance, a recent poll from the Kaiser Family Foundation shows. Initially, 56 percent of those polled favored the Medicare for All Act, but then when they learned it would do away with private health insurance, the support fell to 37 percent. Candidates are going to face pushback within their party. House Speaker Nancy Pelosi and other Democratic leaders have not embraced government healthcare, instead pushing for adding funding to Obamacare. But proponents of allowing the government to have a more extensive role in healthcare point out that waste is prevalent in the current system. Patients receive unnecessary medical care, such as repeated tests or surgeries that either don’t make them healthier or even make them worse. These proponents agree with Harris that health insurance companies are unnecessary. Wendell Potter, an advocate of a government-financed healthcare system and president of the Business Initiative for Health Policy, said in a statement that polling results show the healthcare industry’s misinformation campaign to spread “fear, uncertainty, and doubt” was effective. He said that commercial health insurance companies don’t have an incentive to lower healthcare costs and make sure patients can access care. On December 14, 2018, a federal district court judge in Texas issued a ruling challenging the future of the 2010 Affordable Care Act (ACA).The judge sided with Republican state attorneys general and ruled that, since the 2017 tax bill passed by Congress zeroed out the penalty for not having health insurance, the ACA is invalid. Democrat attorneys general have already taken actions to appeal the judge’s ruling in the case and, due to the government shutdown, the 5th Circuit Court of Appeals has paused the case. Currently, the ACA remains the law of the land. If this ruling is upheld, the consequences will be far-reaching.1 Less than half of the public (44 percent) are aware of the judge’s ruling that the ACA is unconstitutional and most (55 percent) either incorrectly say that the judge ruled in favor of the ACA (20 percent) or are unsure (35 percent). Overall, a larger share of the public disapprove (51 percent) than approve (41 percent) of the judge’s ruling that the ACA is not constitutional. This is largely divided by party identification with a majority of Republicans (81 percent) approving of the decision while a majority of Democrats disapproving (84 percent). Independents are closely divided (49 percent disapprove v. 44 percent approve). Fewer – but still about one-fifth (8 percent of total) – change their minds after hearing that as a result of this decision, young adults would no longer be able to stay on their parents’ insurance until the age of 26, bringing the total share who disapprove of the judge’s ruling to 60 percent. With the new Democratic majority in the U.S. House of Representatives, this month’s KFF Health Tracking Poll examines the public’s view of Congressional health care priorities including a national health plan. Most of the public favor the federal government doing more to help provide health insurance for more Americans and one way for lawmakers to expand coverage is by broadening the role of public programs, such as Medicare or Medicaid. The Kaiser Family Foundation has been tracking public opinion on the idea of a national health plan since 1998 (see slideshow). More than twenty years ago, about four in ten Americans (42 percent) favored a national health plan in which all Americans would get their insurance from a single government plan. In the decades that followed, there has been a modest increase in support – especially since the 2016 presidential election and Bernie Sanders’ rallying cry for “Medicare-for-all.” The most recent KFF Health Tracking Poll finds 56 percent of the public favor “a national health plan, sometimes called Medicare-for-all, where all Americans would get their insurance from a single government plan” with four in ten (42 percent) opposing such a plan. This month’s KFF Health Tracking Poll finds the net favorability of attitudes towards a national Medicare-for-all plan can swing significantly, depending on what arguments the public hears. Net favorability towards a national Medicare-for-all plan (measured as the share in favor minus the share opposed) starts at +14 percentage points and ranges as high as +45 percentage points when people hear the argument that this type of plan would guarantee health insurance as a right for all Americans. Net favorability is also high (+37 percentage points) when people hear that this type of plan would eliminate all premiums and reduce out-of-pocket costs. Yet, on the other side of the debate, net favorability drops as low as -44 percentage points when people hear the argument that this would lead to delays in some people getting some medical tests and treatments. Net favorability is also negative if people hear it would threaten the current Medicare program (-28 percentage points), require most Americans to pay more in taxes (-23 percentage points), or eliminate private health insurance companies (-21 percentage points). On October 10th, 2018, President Trump wrote an op-ed in USA Today arguing that a Medicare-for-all plan would “end Medicare as we know it and take away benefits they have paid for their entire lives.”3 One-fourth of adults 65 and older (26 percent) say seniors who currently get their insurance through Medicare would be “worse off” if a national Medicare-for-all plan was put into place. Four in ten Republicans, ages 65 and older, say seniors who currently get health coverage through Medicare would be “worse off” under a national Medicare-for-all plan. Overall, a larger share of the public say a Medicare-for-all plan will “not have much impact” on seniors (39 percent) or say that they would be “better off” (33 percent) than say seniors would be “worse off” (21 percent). A majority of the public say it is either “extremely important” or “very important” that Congress work on lowering prescription drug costs for as many Americans as possible (82 percent), making sure the ACA’s protections for people with pre-existing health conditions continue (73 percent), and protecting people with health insurance from surprise high out-of-network medical bills (70 percent). Fewer – about four in ten – say repealing and replacing the ACA (43 percent) and implementing a national Medicare-for-all plan (40 percent) are an “extremely important” or “very important” priority. When forced to choose the top Congressional health care priorities, the public chooses continuing the ACA’s pre-existing condition protections (21 percent) and lowering prescription drug cost (20 percent) as the most important priorities for Congress to work on. Smaller shares choose implementing a national Medicare-for-all plan (11 percent), repealing and replacing the ACA (11 percent), or protecting people from surprise medical bills (9 percent) as a top priority. One-fourth said none of these health care issues was their top priority for Congress to work on. Continuing the ACA’s pre-existing condition protections is the top priority for Democrats (31 percent) and ranks among the top priorities for independents (24 percent) along with lowering prescription drug costs, but ranks lower among Republicans (11 percent). Similar to previous KFF Tracking Polls, repealing and replacing the ACA remains one of the top priority for Republicans (27 percent) along with prescription drug costs (20 percent). One of the major narratives coming out of the 2018 midterm elections was the role that health care was playing in giving Democratic candidates the advantage in close Congressional races. Consistently throughout the election cycle, KFF polling found health care as the top campaign issue for both Democratic and independent voters. While a majority of Democrats want the new Democratic majority in the U.S. House of Representatives to focus on improving and protecting the ACA, Democratic-leaning independents have more divided opinions of the future of 2010 health care law. These individuals – who tend to be younger and male – would rather Democrats in Congress focus efforts on passing a national Medicare-for-all plan (54 percent) than improving the ACA (39 percent) – which is counter to what Democrats overall report. In addition, when asked whether House Democrats owe it to their voters to begin debating proposals aimed at passing a national health plan or work on health care legislation that can be passed with a divided Congress and a Republican President, Democrats are divided (49 percent v. 44 percent) while Democratic-leaning independents prioritize House Democrats working on bipartisan health care legislation (53 percent) over debating national health plan proposals (39 percent).